We’ve all heard it: a picture says a thousand words. But what are those words? It’s easy to assume that those words are the thoughts you have about the picture, but that’s not the case. Everyone who looks at a picture will imbue it with their personal views, their experiences, their biases, their emotions. The thousand words shared by one person in one picture will be lost in translation and replaced, at least in part, by the person viewing the shared picture. I often consider this before sharing pictures (or anything else, really, but this essay is about pictures). And I’ve been considering it much more as I prepare to write my annual Dumb Letter to Summer’s parents, Lisa and Eric. Do I send them a picture in this, my fourth, letter update? It’s been ten years since the adoption finalized. A decade since I saw my last glimpse of her face. A decade since they’ve seen mine. Since then, I’ve changed a lot. My hair and my style have changed numerous times. I’m much thinner than I was during the entire course of our relationship and my face doesn’t really look the same anymore. I was recently married and have beautiful pictures I would love to share with them from one of the most magical and life-changing days I’ve ever experienced. I haven’t included a picture in my annual letters since I started sending them. I usually spend a few weeks searching for words to give them, another few days trying to commit those words to my computer screen, hours upon hours editing and rearranging and replacing them, and days to steel myself (and my shaky hand) before trying to write them by hand on paper. It’s a process, and it hurts. I’m trying to craft a letter to people I barely know, who pretty clearly (to me) do not have any interest in changing the scope of our relationship. A picture could change everything. If I sent a picture of myself to them in the letter I’m currently writing, our relationship could forever change. They could see my picture and see the thousand words I intended to convey: the story of who I am now. It could right the wrongs from a decade ago, show that I’ve grown and have found success. It could calm their [assumed] fears about me or having a relationship with me. They could see my face and recognize my spirit as a kind and humble person, leading to empathy and opened lines of communication. They could see my picture and see a contorted version of my thousand words: a story where I am successful now and am trying to weasel into their life in order to take their child away from them. It could cement their annual decision to ignore my letter, and their ongoing decision to disregard our original contact agreement. They could assume I’m a creep who is so full of myself that I write them unsolicited letters about myself every year and now am sending unwanted pictures, proving that I’m a narcissist and a danger to their family. They could see my face and apply any biases they formed ten years ago or have picked up along the way, leading them to continue to keep me away. There’s also always the possibility that both Eric and Lisa don’t actually get to see the letter – that one of them throws it away before the other knows. In which case, sending the picture won’t matter at all. If they’re not sharing it with each other, or they’re throwing it away without reading it, my whole endeavor is in vain. My letters require an empathetic person to understand. If one of them is hiding the letters from the other, the person reading them is not the kind of person who will truly hear me…or care. If one or both of them makes the decision to throw them away without reading them, they are not the kind of people who will never truly hear me…or care. How do I consider their feelings? As someone who is constantly on guard to ensure I don’t say anything that will hurt anyone’s feelings, this decision has been incredibly difficult to work through. Just as choosing the right words for the letters is a nearly insurmountable emotional task, deciding whether or not to include a picture has been painstaking and draining. How Lisa and Eric feel about me may matter a whole lot with regard to Summer. What if they treat her differently because of my words or once they can see my face in hers? What if my letters spark some kind of emotional reaction in one or both of them, leading them to depression or illness that affects their whole family? What if Eric and Lisa disagree on the decision to shut me out and fight over their lack of communication with me and my letters exacerbate long-standing issues between them which would affect their whole family? What if adding a picture this year takes any of these issues that may have been festering for who-knows-how-long over the top and out of control? I’m sensationalizing. But only a little. I should call my book “What If? …the dissonance within a birthmother”. Ultimately, I cannot know how my words or the arrival of my picture might affect Eric, Lisa, or Summer. In true birthmother fashion, I must decide what to do without any foresight. Without any resources, any knowledge. Just faith. Faith is not something I do well…but that’s a topic for another post. I have to determine the pros and cons of sending a picture without any idea of the weight of any item on either side of the list. Is the idyllic potential real and possible enough to take the risk of further encroaching on their private family life? Is the tragic potential real and possible enough to warrant not showing them a little more of myself? I can’t determine whether I would gain or lose whether I sent a picture or not. Or if Eric and Lisa would. Or Summer. The possible outcomes are endless. I can handle continued non-contact. I wouldn’t have made it through this decade if I couldn’t handle the silence. It’s awful, but I have learned to live with it and that’s fine. What I can’t handle is possibility of an outcome where I lose a happy and positive future with my daughter and with her family, or an outcome that leads to pain for any of them, especially Summer. I have to decide if the risk of those unbearable results is worth its much-desired counterpart of opened contact, take action, and stop with the “what ifs”. Here I am, a thousand words later, still unable to make a decision. In an age where selfies are shared with reckless abandon, even by me at times, I am mired in this tangled deconstruction of an analogously bombastic situation fused mostly with invisible wires. I sit here, frustrated and frozen by my need to over-analyze before taking action. But actions have consequences and require thoughtful reflection. And so do pictures. What would you do? Do you have thoughts or insights about this situation? Leave a comment below – I could really use your help with this decision. 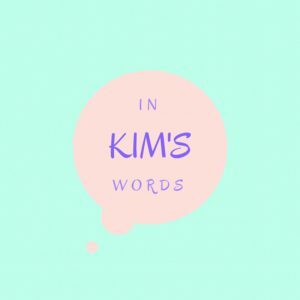 To be the first to know when I write about my Dumb Letters, subscribe to In Kim’s Words.